Although no one at the Vatican was talking about the encyclical's content, a sneak preview of its basic themes was offered by Ignatius Press, the English-language publisher of the pope's writings. 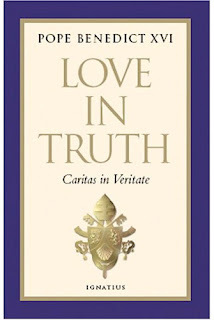 "Love in Truth" applies the teachings of the pope's first two encyclicals (on love and on hope), to the major social issues of today's world, the publisher said. The first part of the new encyclical examines the contributions of Popes Paul VI and John Paul II to Catholic social teaching, in particular their rejection of simplistic conservative-liberal categories and their insistence on the importance of natural moral law, it said. The encyclical's second part outlines moral principles needed to confront contemporary social issues, including assaults on human dignity and human life, poverty, war and peace, terrorism, globalization and environmental concerns, it said. From the beginning of his pontificate, Pope Benedict has aimed to revive the roots of the faith. He has made clear that this is not a theoretical faith built solely on theological arguments, but a faith lived in the real world among those who suffer, and based on the dual commandment to love God and one's neighbor. Speaking to the new Lithuanian ambassador to the Vatican in early November, the pope eloquently summarized his essential message in a few quick strokes, and in the process critiqued the consumer society. "Since love of God leads to participation in the justice and generosity of God toward others, the practice of Christianity leads naturally to solidarity with one's fellow citizens and indeed with the whole of the human family," he said. "It leads to a determination to serve the common good and to take responsibility for the weaker members of society, and it curbs the desire to amass wealth for oneself alone. Our society needs to rise above the allure of material goods and to focus instead upon values that truly promote the good of the human person," he said. And speaking of societal values and the common good, a 1985 paper presented by then-Cardinal Ratzinger at a Rome symposium on "Market Economy and Ethics" has been making the rounds since the Italian finance minister dubbed the now-Pope as a "prophet" of the ongoing economic meltdown in an address earlier this week.